Weekend Assignment #172: Talk about a time in which you moved or traveled a significant distance under your own power. That means walking, running, swimming, biking, hiking, and so on -- in some significant way your muscles were involved. As for the distances involved, think miles; we're talking some real effort. It doesn't have to be a marathon or a triathalon (although those would count), just a time when you got to the end of what you were doing feeling tired but possibly triumphant as well. "Did you hear about the rare bird?" The man who came up to me at the Tanque Verde Swap Meet that June day must have been someone I'd met at Madera Canyon or Patagonia, but I didn't recognize him. "Which one?" I asked, casually. He was balding and thirtyish. "A rare warbler has been found in Sycamore Canyon, down on the border. It's on the tape." 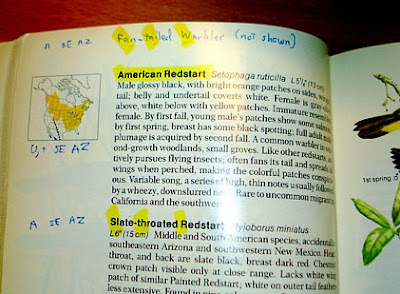 "The tape," I realized, was the Tucson Audubon Society's Rare Bird Alert number, but I hadn't heard about any rare warbler. The unknown birder, my husband John and I stood in the Arizona sun amid acres of junk merchandise as we discussed the Mexican rarity. It was a Fan-tailed Warbler, previously seen only about three times in North America. Our informant had seen the bird two days before, having hiked in twice to the place where a red handkerchief tied to a stick marked the rarity's location. It being only the fourth occasion on which this species of bird had been seen in the U.S., it wasn't even in my National Geographic field guide. It was in the next edition, which I eventually bought just to have a copy with the warbler in it. But that Saturday in June, 1987, all we had to go on was what we could learn from Tucson Audubon Society. So John and I drove over to their converted house near the U of A, talked to some people, and considered the pros and cons. 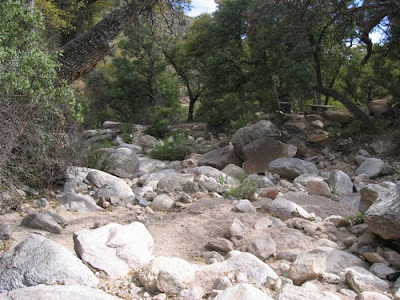 Sycamore Canyon was about an hour away, a three mile, fairly rugged hike along a rocky creek bed. 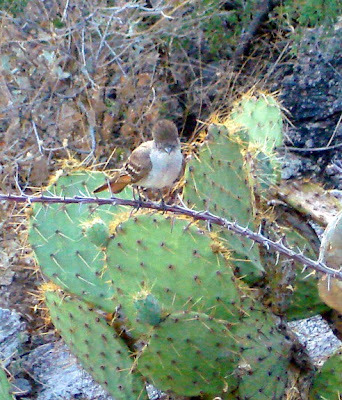 The bird was two and a half miles in, about half a mile from the Mexico border. I was a little concerned about the reported ruggedness of the canyon, but not because of the effort. I was worried about my ankles. I've been spraining and breaking them on a regular basis since the first week of 10th grade. I've done it in school, in Guadalajara, in my driveway, and even outside Popeye's. I'll never ski or skate again, not that I was ever good at either. Hiking wasn't so bad, but even with my cheap hiking boots, I was asking for trouble. Still, it was a rare opportunity, and I had been doing a lot of birdwatching the past year in connection with a book I wanted to write called Critters, and John was up for the adventure. So we went anyway. I don't have a picture of Sycamore Canyon. It looked a bit like this, but drier and steeper. We drove down to the trailhead that night, camped out in our van, and set off just after dawn. John carried jugs to water to hydrate us; after all it was June in Arizona. But they got heavy and awkward, and dragging them scraped the plastic and made them leak. John stashed two of them along the way, figuring we could retrieve and drink from them on the way back. Word was that the bird had a habit of hanging out near the marker until a certain time (7:30 or 8:30 AM, I forget which), and then flying away to parts unknown, or at least inaccessible. I was a little dubious about this. Why would a bird keep a schedule like that? How would it do so? A couple of groups of birders passed us on our hike in, including one in which some guy was talking about "Roger," as in Roger Tory Peterson, author of a famous field guide and apparently an acquaintance of this rather smug birder. We were almost two miles in, but time was passing, and John tried to hurry me along. "If we don't go faster, we'll miss the bird," he said. "If you make me go faster than I can go," I told him, "I'm liable to sprain my ankle, and then it will take a helicopter to get me out." "Well, you'll better be careful, then," he said, "because no helicopter is coming, even if you do sprain your ankle." You know what's coming, right? It happened about two miles in. I twisted my ankle on a rock. It wasn't the worst sprain in the world, though, and we were most of the way there. We decided to keep going. John found me a good dead branch to use as a walking stick. "I've got the stick right here," he said. "Its name is Paul Revere," I sang back, quoting from Guys and Dolls. We laughed, and resumed our progress. About a quarter mile later, the other ankle went. This sprain was ever so much worse. But we were almost there, and I didn't want to be defeated. After a short rest we continued, struggling along that last quarter mile. The birding group with the braggart was hanging out, hardly paying any attention at all to the bird. I'm pretty sure I heard it. I may have seen it, for a split second, as it flew away on schedule. But I saw no features, and so could not identify it. It didn't count. We started the long hike back, me on two sprained ankles. None of the birders who passed us offered sympathy, much less offered to help. I asked one guy to call the video store I worked at, and let them know I wasn't going to make it to work that afternoon. He said he'd call. He didn't. We ran low on water, with maybe a mile and a half to go. John left me with the last, nearly empty jug and hiked ahead to retrieve one of the stashed ones, or to refill a bottle at the trailhead if need be. He later reported he was hallucinating slightly by the time he got to water. I struggled along behind. Then there was a fork in the creek bed. I didn't know which way to go, and I didn't want to get lost. So I climbed up on a boulder, and played a tape of bird calls, a canyon wren call that elicited an answering call from a real wren. John did not reappear, and it was well into the afternoon by then. I picked what I thought was the most likely direction and resumed my slow trek out. And hooray! I guessed right. I was reunited with John about an hour later. We reached the trailhead about 7:40 PM if I remember correctly, right around dusk. I'd been in the canyon for fourteen hours. The podiatrist I went to the next day diagnosed a broken ankle and two sprains. "The sprain is worse than the break," he told me. I was in a soft cast for four weeks. My job in the video store did not allow for sitting down, and they weren't particularly interested in making accommodations. I ended up taking a job with another video store for less money, where I could sit down. But they were larcenous. Even my boss said to watch my pay carefully to make sure I wasn't cheated. (They soon lost one of my paychecks for two weeks.) And the day the cast came off my foot, I was assigned to walk around the four parking lots at Grant and Alvernon, putting flyers on cars. They were advertising a personal appearance by Gumby, even though they knew by then that the Gumby costume had fallen through. They planned instead to use a chicken suit, and try to pass it off as Big Bird. That's more or less when I decided to go to school to become a travel agent instead. That led to becoming a bookkeeper, which led to becoming an accountant. But it all started with that darn fan-tailed warbler, the bird that got away. In a little over 36 hours, I'll be watching the last Doctor Who of the 2007 season, a few hours after the BBC broadcasts it. On July 6th, it starts up here, on SciFi, the same episodes I've watched way too many times already, but I'll be there anyway. A new season of the Doctor Who spin-off Torchwood is coming, and The Sarah Jane Adventures, and then the third annual Doctor Who Christmas special, appropriately airing on Christmas. And at this point, I'm not so much waiting to hear from a publisher, as a publisher is waiting for me to finish my latest "final" edit of Heirs of Mâvarin and send it off. (The publisher doesn't know this yet, of course.) And a few of you may actually be waiting to read the sequel to The Jace Letters that I promised to start posting on my fiction blog. So far Jace seems to be dawdling over her email to Sandy in London. Sandy is already discovering something strange there, but she hasn't told anyone what it is yet, including me. So what shall we do while we're waiting? Well, I'm just finishing up watching the 2005 series of Doctor Who on DVD, but I did do a little work on Jace's letter, and I hope to finish editing Chapter Four of Heirs tomorrow night. And because Thursday night is Scalzi night and I'm stubborn, I'm going to to a Weekend Assignment anyway. I've been doing them almost from the beginning, but the key word there is "almost." I never did the first one ever, because back on April 16th, 2004, I'd never heard of John Scalzi. Time to rectify that little oversight! Your Weekend Assignment #1: Share 25 totally random facts about yourself. Include at least one you've never shared before with anyone. When I was in about first grad, maybe second, I got in a fight with Jamie Gerber, my only classmate at Manlius Elementary who had also been my classmate at Pebble Hill School in kindergarten. She was trying to take my toy dog Trophy. I pulled on Trophy, and somehow managed to flip Jamie over my shoulder. End of fight. The first time I met Cindy R., I was eight years old. There was a dead bird in the street, somewhere near where Berkshire Parkway meets Somerset Lane. Cindy advised us not to touch it, for health reasons. She was seven years old at the time. A year or two after that we had a fight, and I think I flipped her, too. That fight involved my jacket somehow, as a weapon. That was the last time I ever flipped anyone. Like the first time, it was totally accidental. Most of the time we got along, though. We collected china animals and Britains Ltd. plastic animals together. I've long since forgiven Stevie C and Greg K for what they did over forty years ago. Forgiving Brian G. was a little harder, because he was never, ever anything but mean to me. And no, I'm not going to elaborate. 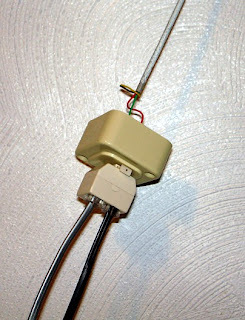 Speaking of phones, I've just been staring at a phone jack, dangling from a wire running through the board that holds up my totally inadequate room air conditioner. Two little wires are exposed where that cord meets the jack, a red one and a green one. If it led to a bomb, which would be the correct wire to cut? One exception on the onions: toasted bits of onion on bagels, onion rolls, etc., or in onion dip. No exception on the olives, although I can tolerate olive oil if I have to. When I was a kid, I called egg salad sandwiches "egg and olive without the olive." This was because my mom called then "egg and olive sandwiches," and prepared them accordingly. Ack! My favorite character in my own work varies, but I'm especially fond of Rani and Fayubi. I worry that I won't be able to write Kate's story properly. 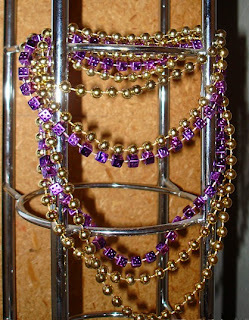 I have Mardi Gras beads hanging from an otherwise empty CD tower at the moment, left over from Employee Appreciation Day. I haven't updated the church blog and website this week. There is a little red x on the Norton 360 icon in my taskbar or tray or whatever. It's been there all night. It probably wants to optimize my hard drive, but it can't until I get it 15% cleared off. I feel guilty about certain emails I haven't replied to yet. I worked late tonight, trying to get a couple of things done, but didn't quite get there. When I called before leaving the office, to see what to pick up for on the way home, John asked for a pony. Safeway was out of ponies. I checked. I never got out of the office for lunch today. Don't really mind, except that I was going to go make a car payment near Speedway and Alvernon. The drive over is long, hot and no fun. I'll do it tomorrow instead. I also have big plans to clean the refrigerator, but not at lunchtime. I'm pretty sure the last fan letter I wrote to an actor was to Wayne Rogers when he left MASH, trying to talk him out of it. 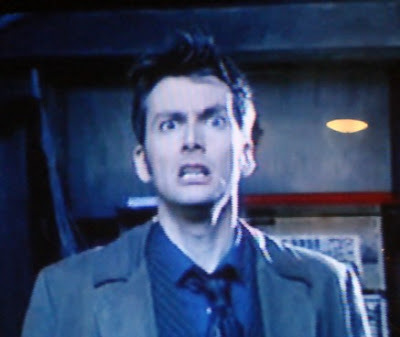 There's a half-written fan letter to David Tennant on my desktop. I have a theory about the Toclafane. I'm thinking about posting it on my LiveJournal tomorrow night, so we can all laugh on Saturday about how wrong I was. I'm sure there are a number of things there I haven't told anyone before. Don't expect me to point them out, though. The plan for tonight was to show you some more experimental pictures related to this week's Round Robin theme, "Focus on the Details." 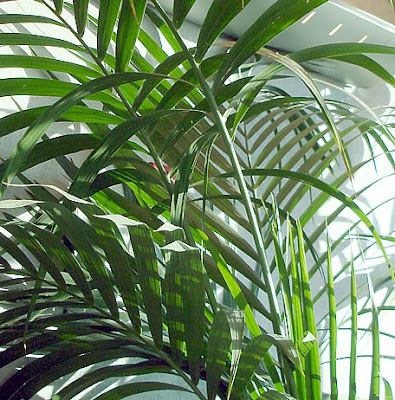 There were going to be at least a few photos in the mix that weren't actually of plants, but since then I've gotten sidetracked. That's okay, because it's an interesting sidetrack, much more fun than a picture of the vase! 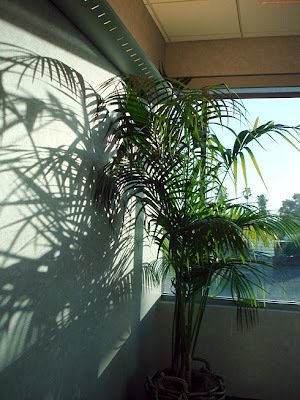 Well, that's kinda neat, but I still don't like it as well as "my" plant. What did they do with it? Oh, there it is! Other corner of the same tiny stretch of hallway. Except I don't think there's as much light there. I hope it does okay in that spot. Let's step outside now, for a detailed look at two tree trunks. This one - possibly a sycamore, maybe a cottonwood, what do I know? 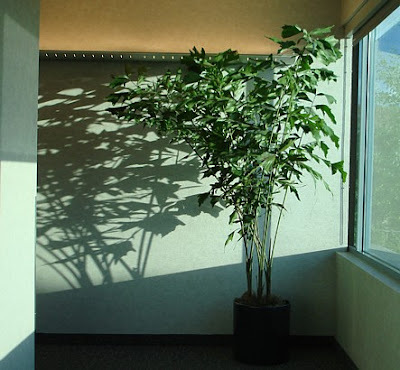 - has a little tiny new branch near the base of the trunk. 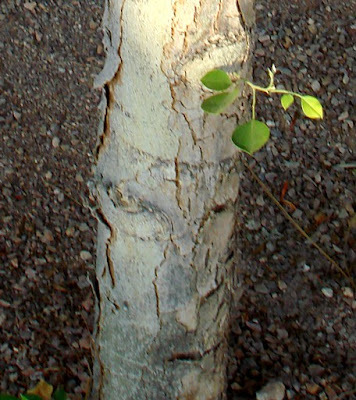 Also, the pattern of cracks in the bark give the bottom of the trunk sort of a Tiki-style face. Do you see it? 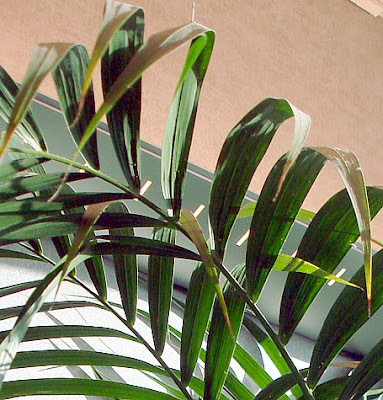 And for some time I've wanted to show you what a palm tree trunk looks like up close, but most of my pictures of them have been too dark, too far or out of focus. But this one came out okay. And again I see a face pattern in the trunk, in this case kind of a mummy face looking dubious. Ah, here we are, Round Robin time again! This week's topic, "Focus on the Details," comes to us from Tammie Jean of Long Drives To Nowhere. My friend's sweater was across the room. 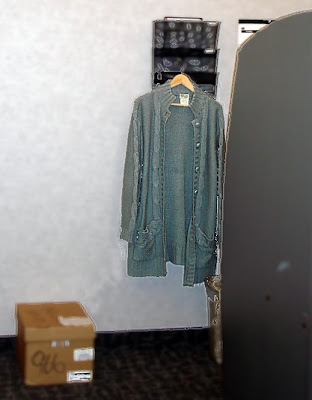 I selected the non-sweater bits and blurred, and sharpened the sweater bits. Eh. I can't decide what these leaves resemble more, corn stalks or green bananas! I have some more detailed experiments, but I'll save them for tomorrow night. Now go see what the other Robins are up to! Your Monday Photo Shoot: Get a picture of a crowd or crowded event. Conventions, weddings, parties in cramped spaces -- you know, anywhere there's lots of folks doing something. I've actually posted my best crowd pictures before, from the same trip as the one below. This time out, let's focus on one particular crowd at one particular outdoor show. Where was this taken? Can you tell? Sharp-eyed readers may have noticed the words Disney and Pixar, the Finding Nemo logo and something that looks suspiciously like a monorail track. Yup, it's Disneyland. But who is the cute guy in the tan costume, and why do people care? Another angle, a couple of minutes later. We see now that this is Tomorrowland Terrace. No sign of the cute guy in this shot, but do you see one of his enemies? There is a sign to tell us what this is all about, but it's not quite clear yet. Aha! The cute guy is a Jedi, instructing apprentices at Jedi Academy. Some of the people in the crowd are undoubtedly proud parents, brothers and sisters. Ah, but where did they go? Have they been vanquished by the enemy? Is it a trap? I actually never got close enough to hear what was going on, but I'm fairly certain the young Jedi won out in the end. Good thing, too! We really don't want Darth Vader and Darth Maul on the loose, taking hostages in the Haunted Mansion, threatening Mickey Mouse, or riding the teacups. I've been thinking some more about adventures in the real world, whether the opportunities are there, whether they're desirable, and why most of us don't have them very often. Part of the answer, I think, can be found in the Tolkien quote above. We may not be as openly antagonistic toward adventures as Bilbo is initially, but we are motivated by the same desires. We don't want things to get nasty, we don't want to be disturbed, we don't want to be uncomfortable, and we don't want to be late for dinner. If adventuring requires all this of us, many of us would just as soon pass. Heck, most of the time we can't even be bothered to try a different restaurant, shop at a different grocery store, or do anything that requires us to make the tiniest leap into the unknown. For example, I keep thinking about the people from St. Michael's who go down to Guatemala each summer, bringing medicines, helping hands and the occasional Jeep. I've said I would never do that myself, but why? Because I would find it disturbing and uncomfortable, that's why. My shyness and low embarrassment threshold would make the whole trip painful for me emotionally. Being fat and sedentary means that the physical demands would be too much for me. Going without John would make me lonely, and getting away from my job for six weeks would probably be impossible. Oh, goody! I'm off the hook! Some people do it, though. At least one of the Guatemala volunteers goes down there every year. 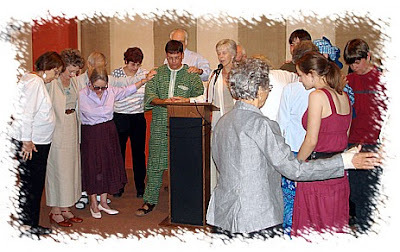 And then there's the family in this picture, being blessed by members of the congregation before the parents and two teenaged boys go back to Niger to teach about the gospel, build wells and alleviate famine. They've been doing this off and on for a decade. I asked the father whether he'd always known this was going to be his life, and he acknowledged that by college he was preparing for it professionally. Risk averse? Not him! Would I go to Guatemala, to Niger, to Iraq, to Sudan, to have adventures and make a real positive difference in the world? I'm afraid the answer is no. Make me late for dinner! Well, no, it's not the dinner, really. It's the fear, not so much the fear of death as the fear of being surrounded by people I don't know, doing things that are hard or scary or unwelcome. I believe strongly that there is no Them, but the truth us that I'm uncomfortable around large numbers of unfamiliar Us. Heck, I'm shy toward parishioners sitting near me at Coffee Hour, if I don't already know them. Still, there are lots of people much braver than I am, who go out and seek adventures. There is a genetic predisposition toward risk-taking that I clearly lack. Years ago I heard from a journalist named Joshua Wander, who had come across my earliest postings about the fictional character of the same name. The real Wander was involved in a club for risk-takers, and I can't help but think Ariel's dad would approve. But would I go to the Lonely Mountain with Thorin Oakenshield, if Gandalf asked me? Well, actually, I might, if I were an unmarried hobbit in the prime of life. It's hard to be sure, though, because it just isn't going to happen. Would I travel with the Doctor? I'd try it once, anyway. It would be ever so much easier than staffing clinics in tiny Mayan villages: no medical procedures, no hiking, no need to learn a different language. Would I go to sea with Black Rose Kate? Probably not; that would be both dangerous and uncomfortable! But reading about it, writing about it, watching it on tv, that I can do. Vicarious adventures may be less satisfying, but they hardly ever make you late for dinner. After my musing last night about the limited opportunities for adventure in the real world (especially if you don't want to do anything actually dangerous or uncomfortable), I had an adventure today. It wasn't anything amazing, no talking dogs beneath a pink sky, no saving the world. But it was a rut-breaker at the very least, and something I've never done before. I assisted at a wedding today. I've known it was coming since last Sunday, but it was so much more than I signed on for. I thought I was just going to carry in the cross as I do most Sundays, and maybe carry a torch (candle) at a few points during the Mass. But no, I got to do a lot more. I was the lector for the First Reading (from the Song of Solomon), the Psalm (Psalm 67), the Epistle (Colossians), and the Prayers of the People, matrimonial addition. 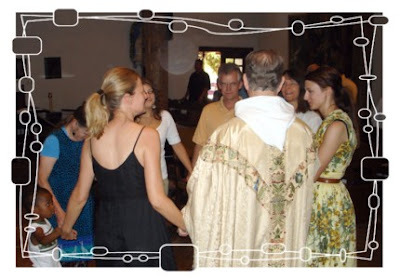 I took the pail of holy water and set it on the altar, and the platen that held the wedding rings and set it on a side table in the sanctuary; I forget the name of that little table. And for the first time I was the chalice bearer as well, helping to serve communion. I only messed up about three times. Rev. Angela tried to say something helpful during the psalm, and it just threw me off. I had to start it over. Then I lost the page for the Prayers of the People, and was distracted enough about that that I lost my place in Colossians for about ten seconds. And when I served communion, I was sufficiently thrown by my first-ever communicant being a little kid that I held the chalice way too low for the adult with the kid. But it was good, and interesting, and fun. Aside from the little mess-ups and stumbles, I read well and with feeling, and I didn't make any mistakes in putting things away. One of the pieces our organist played was Bach's Jesu, Joy of Man's Desiring, the same piece to which I walked up the aisle 28 years ago. And when it was all over, the groom praised m reading, thanked me, and pressed an unexpected, folded $20 bill into my hand. This was the fourth wedding I've ever attended, and the first I've been to at St. Michael's,et alone served at. It was Rev. Angela's first wedding officiation as well. I told her afterward that when I was a kid, I would sometimes say that I'd never done such-and-such before. My dad would say, "You'll never be able to say that again." Hooray for finding a new experience at the age of 50! Looks pretty determined, doesn't she? From all that I've read, she's going to be the key to getting the Earth out of its latest scrape. Good for her! I'm actually not too worried about Martha getting through it. I'm nervous about the Doctor, though. There have been a number of ominous hints lately, and I hope I'm interpreting them wrong. That's all I will say for now. But the episode had some fun moments. Harold Saxon was as funny as he was menacing, writer Russell T Davies disposed of last week's cliffhanger with a clever variation on "With one mighty leap...", and there was a truly chilling moment in which Saxon's wife dances to the music of disaster. And we got to see a certain planet again. Good stuff! And it all starts airing in the States right after the 4th of July, on SciFi. If I could have anything I wanted right now, what would it be? It was one of those almost-random thoughts my brain throws at me when I'm tired; it doesn't necessarily mean anything, except in a very vague and general sense. Nevertheless, I decided to try to make sense of the question, and answer it. Food? Not hungry right now, thanks. Situation? There's always the world peace thing. But I also found myself wishing for an equally implausible, more personal situation, such as suddenly turning up in another world. Possession? Well, a time machine, obviously, and a personal teleportation device (transmat). Goal? Well, you know that one: Karen Funk Blocher, author of the bestselling Mâvarin books, the first of which she has adapted to screen as a major motion picture, coming soon to a theater near you! Yes, that's another world too, isn't it? See, I don't want much, just the impossible! I want to do something ever so much more interesting than making numbers add up, or watching DVDs, or even going to Disneyland. I want excitement, adventure and really wild things, but not the sort the real world has on offer. I'm never going to go to Guatemala with other St. Michael's parishioners, hike into remote villages and set up clinics. It's just not gonna happen. But I can handle chatting up a talking dog beneath a swirling pink sky, as long as neither one kills me or totals my car. And it occurs to me that this is one of the main things fiction is for. We can't go around traveling in time or saving the world; at least, most of us can't. We can't meet a handsome and mysterious man on a windswept hill, or thwart the plans of Russian spies, or solve a murder that baffles the local police. But we can read about those things and experience them vicariously, in the safety of our own homes. It's probably not that rare a dream, either, wanting outrageous adventures without sacrificing personal safety. I was thinking tonight about good old Del Merden, Rani's best friend. He's always been a sort of Tom Sawyer character, a teenager with an active imagination, a sense of adventure and a knack for getting into scrapes. But there's more to him than that. Sure he's bored with doing chores in his uncle's stable, but when he leaves home it's not just wanderlust. He wants to help Rani, and he wants to find the missing King. In short, he wants to do something that matters, to really make a difference in the world. And what about you? What do you want? Tell me what Food, what Situation, what Possession, what Goal, what Experience would please you about now. Better yet, write it up in your blog and leave a link back here. Do you want a safe and comfortable life, or a dangerous and fantastic one? I really want to know! typos fixed later, after 9+ hours of sleep! Weekend Assignment #171: Talk about the most unusual piece of technology or machinery that you've ever used. It could be some specialized machine or tech you use for work, or perhaps some off-brand curiosity you found at an electronics store, or even (if you're technologically inclined) something you've created yourself. The key is that it's got to be something that makes people go "Huh. That's weird." Extra Credit: Mp3/music player or cell phone: Which would you give up first? My first thought om this was that I haven't used anything unusual. I was therefore tempted to give a fictional answer. I could claim that I really did invent the M-box 3000 Personal Empathy Device, or put myself in the place of my characters, living in a time bubble or taking part in weird physics experiments. Then I remembered some real life bits of odd technology from my Worldwide Travel days. 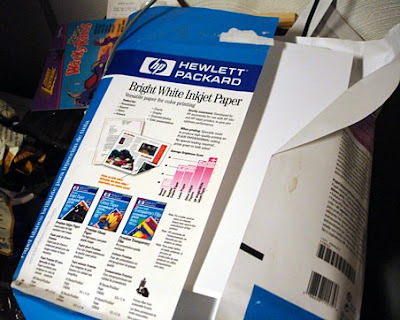 When I started there in 1993, I occasionally used a check printer that dated back to the 1950s or earlier. I would set the dollar amount, load the check and pull the lever - ca-chung! Result: nice, large, old fashioned raised numbers on what would otherwise be a handwritten check. Later on, after a change in banks, Mal just handwrote them instead, the ones I didn't generate on the computer. The other unusual item was what I liked to call the ca-chung machine. It looked like a old style credit card imprinter, which you load with the card and a charge slip with several carbons and then slide the bar across - ca-chung! - to get the card number onto the charge slip. Only the machine I'm talking about wasn't for charge slips. It was for validating accountable ARC documents, which is an industry jargon way of saying it was for preparing handwritten airline tickets, PTAs (prepaid ticket advices) and MCOs (miscellaneous charge orders). Sliding the bar across - ca chung! - put the date and the agency's name and IATA number on the ticket, along with the name and number of the desired airline, transferred from a metal plate the size and shape of a credit card. 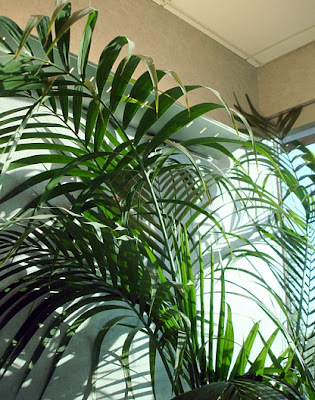 Worldwide Travel used to have two columns of old metal plates displayed on the wall of the conference room, each representing a defunct airline: Eastern, Western, Braniff, PanAm, and on and on. The head of a regional airline once told Mal he decided not to issue metal plates, so that his airline's plate would never hang on our wall. And yes, the airline did go under a couple years later. 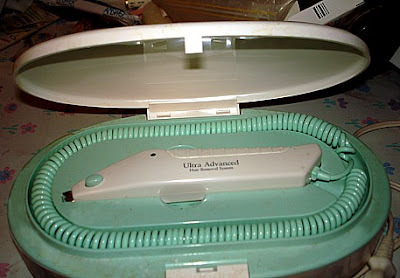 This is the Igia Ultra Advanced Hair Removal System. Yeah, right. You know what it really is? A pair of electric tweezers. Seriously, that's what it is. You plug it in and it supposedly delivers heat or vibration or a low-level electrical current to the hair follicle, so that it comes out easily and doesn't grow back as soon as it would otherwise. 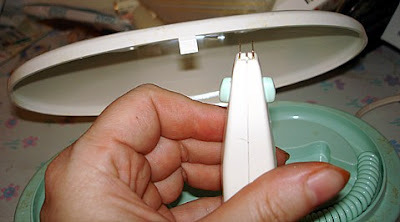 Here it is, the business end of the electric tweezers. You push the little button on the side and the tweezers close on the hair, and do whatever it is that they're designed to do. But it doesn't really work. The short tweezery bits are harder to maneuver than regular tweezers, the hair is no easier to pull out, and it grows back just as fast. And really, I'm not surprised. What are the chances this thing actually delivers heat or a vibration or electrical current to the follicle? As soon as I got the electric tweezers, I was strongly reminded of quack electrical health devices from the early 20th century. I wouldn't be surprised if the power does nothing except light an LED to show the device is turned on. I certainly never felt any definite heat or current or vibration, though it's possible it was there to some tiny degree. It occurs to me that it's almost the opposite of the Doctor's sonic screwdriver. His "sonic" is cordless, compact, and can do almost anything with sound. 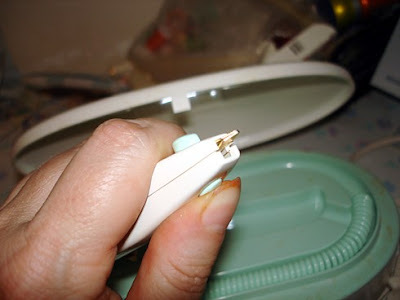 The electric tweezers are surprisingly bulky because of the cord, and do almost nothing, silently. As for giving up the cell phone or the iPod, the truth is that I hardly ever use my iPod unless I'm going to the gym, which I haven't done in a shamefully long time. The phone doesn't get even daily use, except to tell me the time; but I use it more than the iPod. I guess I'd give up the iPod - and then buy an iPhone instead. Ha! I'm plugging away on my Heirs edit. I'm up to Chapter Three, page 100. (Yes, it's a long book.) I've revised away bits of awkward or wordy writing that had persisted for years, draft after draft: nothing major, just individual phrases and the occasional sentence. Never again will an editor consider the odd comparison between clothing and the price of corn, or read about a "soldierly male" selmûn guard. And I found a disappearing cornfield by the Ot Lôven, and changed later visits to that spot so that the descriptions don't actively preclude its existence. Oh, and there was a missing word in Chapter Three. Is that why I never heard back from Tor? Probably not, but it's still embarrassing! And the twins were simultaneously seven months and a year old at the time of the kidnapping. Oops! Fixed. I had a long, difficult day at work today, busy enough and stressful enough that I ranted at some length afterward to a friend in IM. Her response was, "Gee, I wish I were an accountant!" Ha! Hey, I like the actual work. I really do. Even today wasn't actively bad, just overcrowded with demands and distractions and minor crises so that I couldn't get done what I needed to do, even staying late. Yeah, my stress level went up to eleven! But it's been worse, much worse. Tonight I've worked on the Jace sequel a little bit, edited about a dozen pages of Heirs Ch. 2, checked out a bunch of AOL alerts, and watched Doctor Who, of course. I also read my way through a fun bit of Doctor Who ancillary material. The current companion, Martha Jones, has a My Space blog! It's one of a number of fictional web sites put up by the BBC, fun intrusions from the Doctor's reality into ours. For example there's a Vote Saxon web site, promoting Harold Saxon's candidacy for Prime Minister. Trust me, you do not want this guy (shown at right) running the U.K.! But Martha's MySpace is a good read. It starts just over a week before she meets the Doctor, so you get a nice little glimpse of the hectic, reasonably normal life she leaves behind. The conceit of the blog is that she somehow manages to post once a week from wherever she is in time and space, so you get little snippets of backstory and extra stuff that's not on screen, along with what she thinks about it all. I've bookmarked it, and I'll be back. And Jace is going back online. I know that much about the new story. She and Sandy are going to exchange more emails as part of a completely different adventure. I think it takes place in London in 2013, but there will probably be other times and places involved as well. And no Doctor, unless you count Jace's friend Ken, who is definitely from New Mexico, not Gallifrey. But it's late now, and I need to get something approaching a good night's sleep in order to get my work done tomorrow. Good night! Yes, well, I'm not surprised that it happened again, although at one point I had my hopes up that this time, the input would be less contradictory. You see, as of draft #5 of the cover letter to DAW, two beta readers think it's fine, one thinks I should go back to draft #4, and the fourth reader pretty much wants me to scrap it and start over. Last time I worked on this letter, a major revision of last year's letter to Tor, pretty much the same thing happened. The more I revised it based on my friends' suggestions (and my own judgment and insecurities), the more my friends complained it was getting farther away from acceptability. Unable to reconcile the contradictory advice, I got discouraged, and completely lost confidence in the letter. So I put it away for two months. That does nobody any good at all. So this time, I'm not going to let that happen. After giving due consideration to the latest round of suggestions, I'm mostly going to ignore them. Oh, I may change the letterhead from color to black, and I've taken the tag line off the bottom, but that's the end of it. I don't believe there is anything in the cover letter at this point that will actually prevent a first reader from proceeding to the manuscript itself. It doesn't have spelling, grammar or punctuation errors, it doesn't say anything stupid (either self-deprecating or self-aggrandizing), and it follows the publisher's guidelines, such as they are, as well as the standard advice about cover letters. And happily for me, DAW takes the whole manuscript, so it's a clean, one-step submission process. If the first reader gets to page 11 or so, they'll probably keep going from there. And I think the first ten pages are intriguing enough to make that happen. If they aren't, the cover letter won't make a difference, either way. Oh, that's handy: M.S. Word was "not responding"
The next step is to go through the entire manuscript of Heirs of Mâvarin one more time, proofreading and tightening and tweaking, and updating the word count document accordingly. Tonight I cut about 30 words from Chapter One. 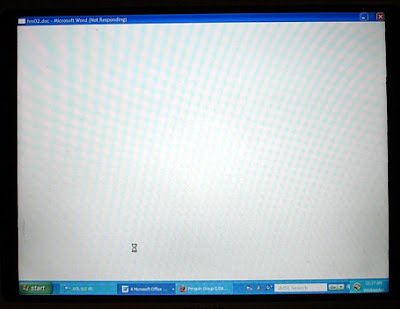 I was partway through Chapter Two when my computer decided to only show me a blank page where my Word documents ought to be. So I rebooted (which takes about 15 minutes because of Norton and backups and such), and redid as many of my Chapter Two revisions and I could find and remember. This probably isn't enough paper. And when all that's done, the printing begins. We're right are the 16-month mark since I mailed three chapters to Tor. It's definitely time to try again. John is going to hate this! 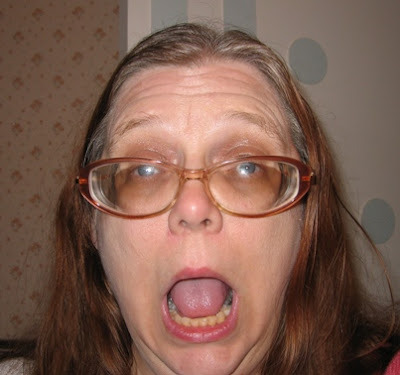 Your Monday Photo Shoot: Show off a truly bad picture of yourself. One that's so bad it's not actually embarrassing, just, you know, inexplicably unrepresentative. If you would like, post a contrasting good picture, so people know what you really look like. Oh, John (Blocher, that is) is really going to hate this. He's always trying to keep from posting unflattering pictures of myself. Ah, well. I did two more drafts of the DAW letter tonight, and I'm feeling good about it. I'm also working on a little sequel (or at least a coda) to "The Jace Letters," of all things. We'll see how it goes. Meanwhile, good night! Is fan-fiction a genre that is an acceptable form of expression, or is it just a version of finger-painting for adults? Explain. Have you ever or do you currently write fan-fiction? If you yes for either question, why did you choose to do it, and what sort of benefit did you gain from this experience? If you write fan-fiction, please leave a link either in your post or in the comments. Please link to something that's not R or X-rated, as this is a "family show." This particular question grew out of a writing prompt involving Doctor Who, which has not generated much response so far. Given my current level of obsession with the Doctor, you might think this would be something I'd jump at the chance to do; but no, it wasn't. I couldn't make myself do that writing prompt at all, for a couple of reasons. The main one is that I pretty much deliberately left fanfic behind a decade ago; it just feels kind of wrong for me to do that now. The other is that I generally avoid fiction writing prompts of any sort. Given all the productive fiction writing I should be doing (and am not doing enough), the last thing I need is to take on an obligation to write fiction that doesn't add to my body of work with characters of my own devising. Writing fan fiction isn't so much finger painting as the creative writing equivalent of riding a bike with training wheels, or starting with a paint-by-number picture and customizing from there. Most of your word building and character development is already done for you. All you have to do is add any customized characters you want, add plot and dialogue and theme (optional), and voila! You've got a story. Mind you, even that's not necessarily easy, and many fanfic writers fail to draft a competent story. Still, it does give amateur and beginning writers (and sometimes experienced ones) a leg up in writing the story, and it's good practice as well as being just plain fun. When you're a fan of a book series, movie, tv show or character, there's a definite allure to exploring what would happen if Character A met Character B and did C. Heck, as I waited for the Doctor Who story "Utopia" to air after seeing that preview clip, I found myself on several occasions running lines in my head for the Doctor and Jack to say. But I didn't write them down. No indeed! Even so, it is certainly a valid form of expression, providing a creative outlet for writers and enjoyment to readers, and generally doing a franchise's copyright holders more good than harm. And it can lead to better things. Many fanfic writers progress to writing tie-in books, which are essentially authorized fanfic. Others move on to writing their own characters exclusively, incorporating what they learned while writing about Captain Kirk, the Doctor or whoever. And that's a good thing. Nor is fan fiction necessarily of less than professional quality. Most of it certainly is, but not all. Still, there probably aren't too many writers at that skill level who work exclusively in an genre for which they will never be paid for their work. the first installment of an unfinished serial about Ace being the Doctor's daughter. None of it's online, or even on my hard drive. It was all well over a decade ago. But I enjoyed doing it, and the ones I actually finished helped me to avoid getting stuck as I turned to writing original fiction. Eventually the fan stuff fell away. I'm not ashamed of it, but I'm not going back to it, either. These days when I need a literary crutch, I bring in Black Rose Kate or Ariel Allegra to help me out. If you'd like to participate in the Writer's Weekly Question, write up your answer in your own journal, and post your link here. Have fun! If you don't want to know major developments in the Doctor Who saga, months before they air in the States, skip the text. I'm a little cagey about it all in this entry, but not so much so that a Doctor Who fan can't get the gist of it. Aside from a short story in F&SF and a little beta reading, I've blown the whole day on Doctor Who. "Human Nature" and "The Family of Blood" were the main episodes I was looking forward to this season, but today's story, "Utopia," was the next one I've been going nuts waiting for. It marks the return of Torchwood's Captain Jack Harness to the parent series, and was widely rumored to end with the return of a certain major Doctor Who villain. I've been wanting the latter character to reappear ever since the second episode of the 2005 series, when the Ninth Doctor first said he was the last surviving Time Lord. Now that this iconic character is back, I'm a little disappointed that the rumors were true - it kind of spoiled the surprise. But still, it's good that executive producer Russell T Davies found a way to reintroduce him, and there was one really major surprise along the way. First things first, though. I think it's been a month since I first saw a publicity clip from a UK chat show, which showed the first two minutes of "Utopia." It's a little shocking. 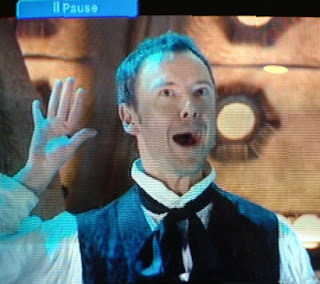 When the Doctor makes a brief stop in Cardiff, Captain Jack Harkness runs for the TARDIS, shouting the Doctor's name. The Doctor sees him on the scanner, and takes off anyway. Jack leaps at the TARDIS and grabs hold of it, and hangs on as it travels the time vortex! 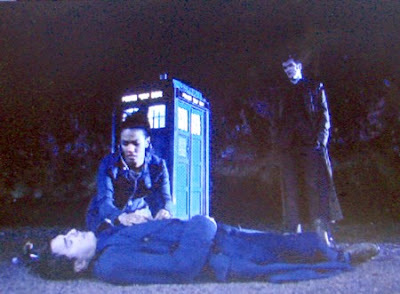 This is the second time the Doctor has left Jack behind. The first time, back in "The Parting of the Ways," he was about to regenerate and therefore a little distracted, and might not even have known Jack had come back to life. Or so we thought. only he can do - save the day in a room full of radiation. 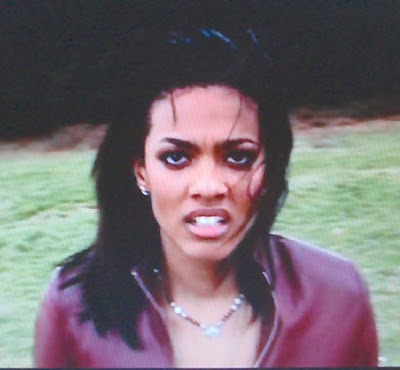 When the Doctor and Martha exit the TARDIS and find Jack dead outside, the Doctor shows some remorse, but is not especially friendly when Jack comes back to life. 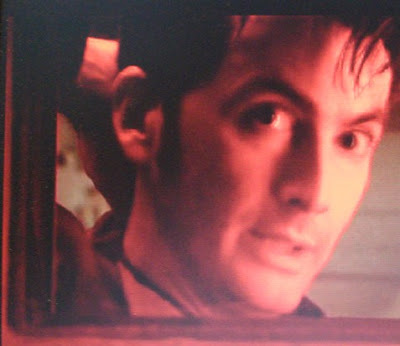 It isn't until later in the episode, when Jack has died and come back yet again, and is working in a roomful of deadly radiation, that he and the Doctor really talk about Jack's immortality, and the Doctor finally explains why he ran away from Jack. I was going to type up the quote here, but I think I won't. It's a pretty amazing scene, though. While all this is going on, Martha mentions to Professor Yana (Sir Derek Jacobi) that the Doctor is a time traveler, and that the blue box is called the TARDIS. This sets in motion the next major revelation of the episode. 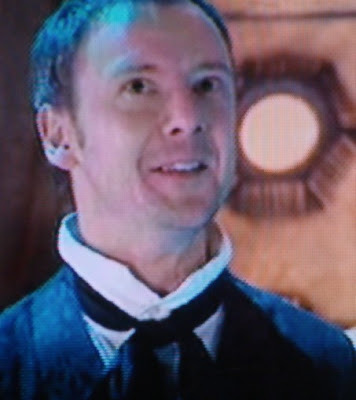 The Professor hears drums in his head, and certain sights and sounds associated with the Doctor seem to set him off. And then Martha sees something very familiar, something that proves that Yana is not what he seems. Her reaction unfortunately provokes the Professor to become someone else entirely. The brilliant thing about it is that I totally didn't expect "Utopia" to reference what previously seemed a completely unrelated bit of continuity. The Doctor's old enemy has a new face. ...leaving the Doctor, Jack and Martha stranded at "the end of the universe" without a time machine, as sharp-toothed, pierced and tattooed cannibal dudes try to break into the room. Eek! There are only two more episodes this season, continuing on from this one. In a way I hate to see it end - but I want to watch the rest right now. At lunchtime today I made a dash over to Wal-Mart, to try to replace the worn out shoes I wear every day. 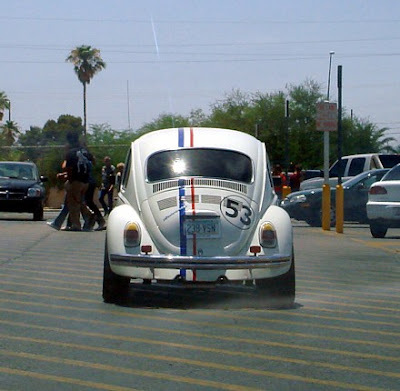 As I pulled into the parking lot I found myself behind this VW Beetle, with its very familiar markings. 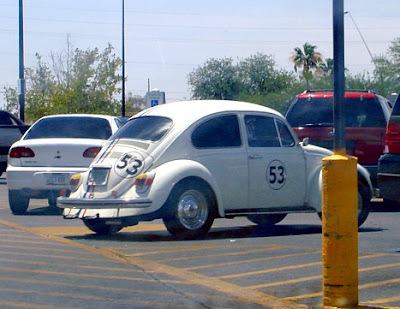 What was Herbie the Love Bug doing at Wal-Mart? Well, parking, it turns out. I never did get to talk to the owner of the car and find out the whys and wherefores. But I did get these pictures for you. That was the only good part of the excursion. Wal-Mart had no plain black loafers in a men's 9 to 10 1/2 W, my usual range. None at all. So I wore my old shoes to a company function after work tonight. See, today was "Employee Appreciation Day" at Unnamed Largish Company. Basically that meant people were allowed to wear jeans to work, and were invited to a Casino Night at the Hilton after work. There was blackjack and poker and craps using company-provided chips (not cashable, and returned at the end of the evening). 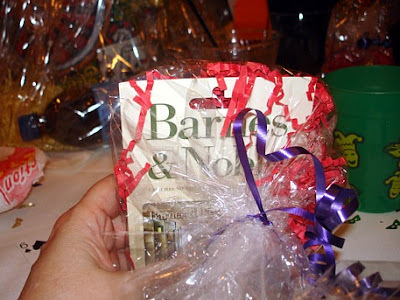 There was food and drink (no drinks ticket needed for my usual "Diet Anything), and there were prizes. I didn't win the plasma tv, the iPod kichen sound system or a covered parking space, but that's okay. 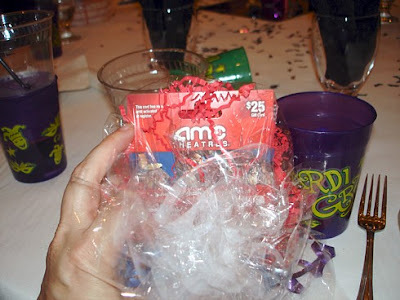 Several of my friends from work did rather well with their prizes, and I won a $25 gift card for AMC Theaters. Then the person next to me also won a gift card. Hers was to Barnes & Noble, which made me a little jealous. She proceeded to complain that it wasn't an ideal prize for her, because "I don't read." Recovering quickly from my shock upon hearing this blasphemy, I offered to swap. So yay - I get to go to B&N! It is not definitive that the particular batch of dog food was tainted. It was from the right time period, but did not quite match anything on the recall list - close, but not exactly. At the time of the recall, there was nothing at all in Tuffy's behavior to indicate any sort of illness. There still isn't, really, aside from the fact that she's ten years old now and therefore not quite as spry as she was five years ago. She's always been a picky eater, so the fact that she's still a picky eater is not terribly indicative. 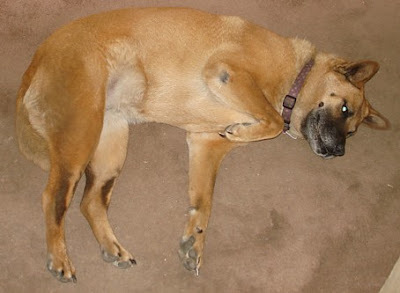 There's nothing we can point at to say why we think she may not be at 100% for a dog her age, just a vague feeling. Yes, of course I'll take her to the vet anyway, probably next weekend. Am I worried about her? Yes, but only a little. The fact is that well before the dog food recall, I was noticing that Tuffy's getting old. She won't last forever; I know that. When she does I'll cry, as I did for Jenny and Noodle before her. But I honestly don't expect this to happen any time soon. 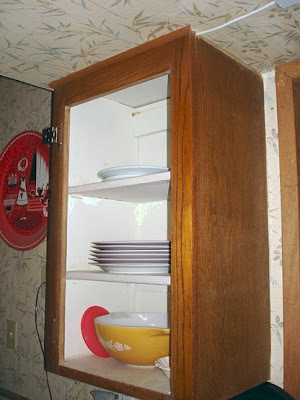 Weekend Assignment #170: Share a useful tip for the kitchen. It can be about anything from cooking to cleaning, as long as it involves something in the kitchen (which, for the purposes of this assignment, includes the pantry and the table you eat at). Extra credit: You're ten and allowed to cook a meal. What do you cook? 1. 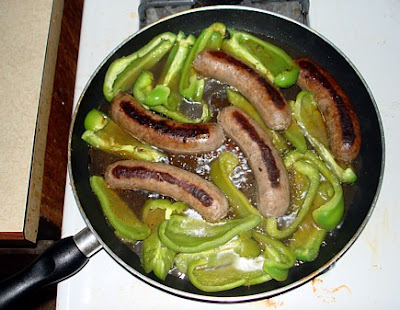 Don't put the sausage on medium heat with just a little water, and then leave the room for 10 minutes. Hey, this time it was only 90% my fault. Honest! 3. 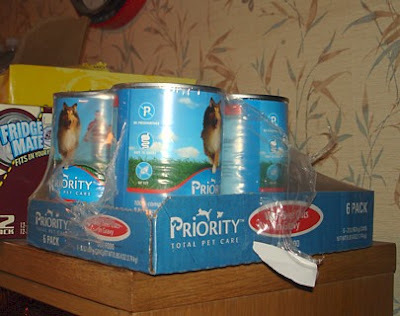 Don't buy a quantity of dog food that turns out a week later, after the dog has eaten two cans of the stuff, to be laced with melamine. John and I are not at all convinced at this point that 10-year-old Tuffy is as healthy as ever. We're trying to work up the nerve for the long drive across town (and probably expensive tests) to learn the answer. 4. 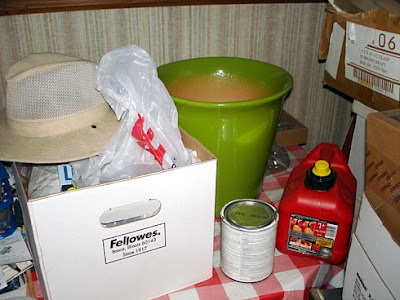 Don't use the kitchen table for storage. Unless you have to, of course. On the extra credit, are you asking me to remember back 40 years, or to pretend I'm ten years old now? I think the answer varies, based on which way we go with it. When I was ten, I probably made Franco American spaghetti from a can and added oregano. I could also make tv dinners, or Kraft macaroni and cheese. If I were ten now, though, I would probably do what I do at age 50: throw something in the microwave. Sad but true! Yes, it's feast or famine around here when it comes to pictures in entries, and tonight we're feasting on leftovers. There have been one or two entries this past week with no photos are all, and others with only one or two. Last night I had, what, about nine, wasn't it? (No: eleven!) Tonight's is a little more restrained than that, but not much! Come on, then; let's dig in! When I was trying to get pictures of things in flight for the Monday Photo Shoot this week, I took a moment to photograph this bougainvillea in front of the house. The significance if this becomes clear when I tell you this very plant was a major exhibit in an entry I did in April, titled Dead Flowers. 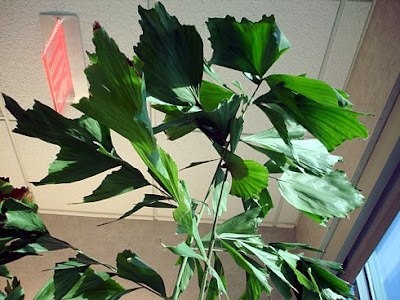 At the time there were no surviving leaves on the plant, let alone flowers. We figured our rare Tucson snowfall back in January did it in. Yet here it is, back from the dead. One of he reasons it looks so nice now is that John did a good job of trimming away the dead vines. 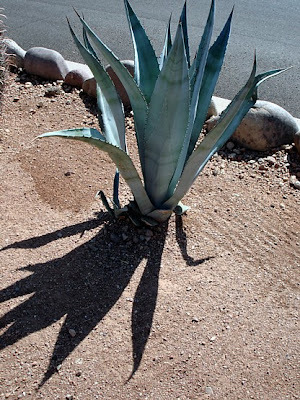 Before I thought of going after saguaros specifically for the Round Robin entry, I thought I might show you some unusual desert plants in general. This aloe plant was at the edge of a local McDonald's parking lot. Incidentally, aloe vera is one of the many things I'm allergic to. 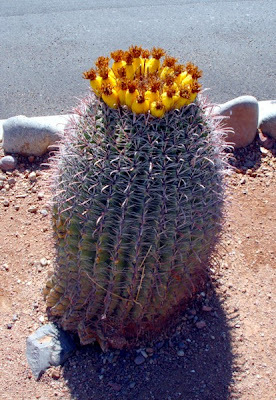 Also at McDonald's was this fishhook barrel cactus. I like the way its pale green is offset by curly purple needles and yellow fruit. Clash much? 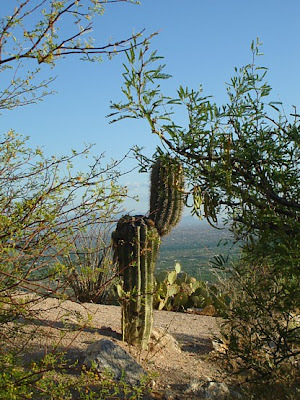 Last night's saguaro pictures were taken at this scenic lookout, Babad Do'ag. We're looking down from the lower reaches of Mount Lemmon at the far east side of Tucson. Same lookout. 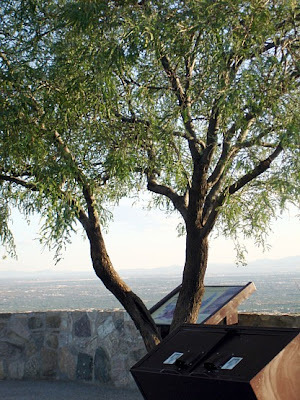 This is a mesquite tree, famed for its use in cooking things. And again, same place. This prickly pear cactus is running a bit dry, although it actually rained a few days ago. The cute little birdie is some kind of flycatcher or peewee, but I was unable to narrow down the identification beyond that. And no, I didn't manage to photograph him in flight. Good night! It's Round Robin time again! 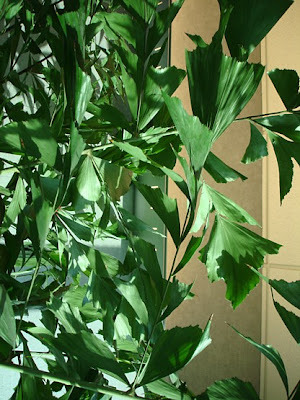 This week's topic, "Fabulous Freaks Of Nature," comes from Meg, author of the blog "In Quest Of." Well, I don't know any six foot frogs, six-fingered friends, or dogs with no noses. 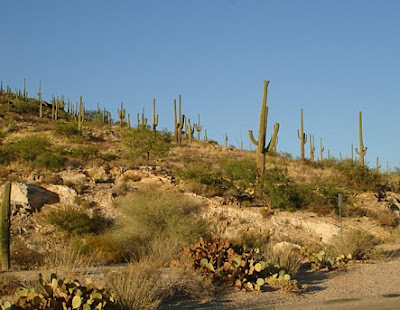 But I do live in the Sonoran Desert, within easy driving distance of whole forests of a large, strange plant that most of you have never seen outside a Roadrunner cartoon: the Giant Saguaro cactus. For a while now I've been feeling a need to get out of the city into the real desert, even if only for half an hour. 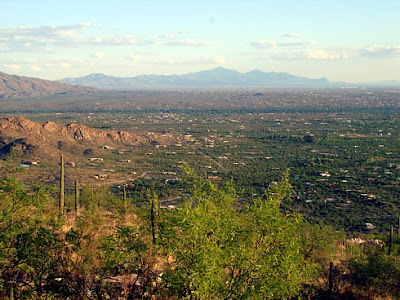 From my part of town, the easiest way to do that is to drive up Tanque Verde, turn left on Catalina Highway, and head a little way up Mount Lemmon. The first scenic vista, Babad Do'ag (which means Frog Mountain), is only about four or five miles up. Two years ago, I took some of my first digital sunset photos up there with the old Canon camera. So that's where I headed after work today. Sunset comes a little earlier in the mountains than down in the city, and there were several couples waiting for it. But when it came, there was no color in the sky. Still, I got some interesting pictures. 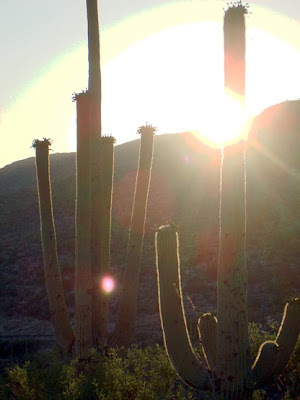 I especially like the backlit shots, which I did by lining up the sun behind the saguaro itself. 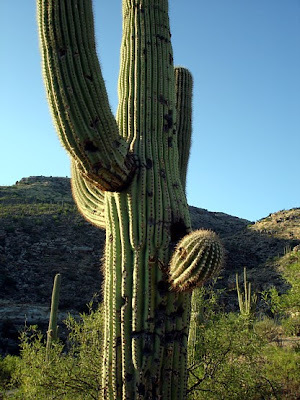 One freaky thing about saguaros, though, is the way people like to anthropomorphize them. They turn the arms and cavities into approximations of human features, and imagine funny things the saguaros seem to be saying. This one, for example, sort of has what looks like a face right in the middle: eye, bulbous nose, mustache and mouth. The arms could be a big green jester hat. But I've always hated that sort of thing. 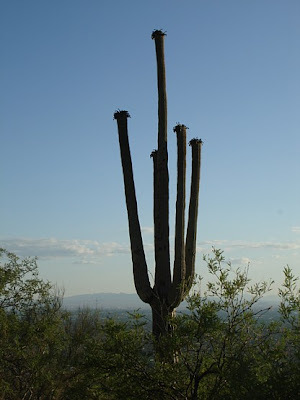 To me, a saguaro is a saguaro. It doesn't need to be a "funny animal" figure. This shot is off in a different direction from the previous two; hence the different lighting effect. But enough with the pictures for the sake of pretty pictures. Let me show you a few things about the saguaro life cycle. 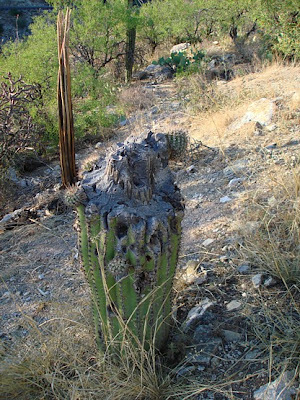 This little saguaro is probably over 75 years old. That's how long it takes for them to get from the size of a pinhead to the point of starting to grow arms. 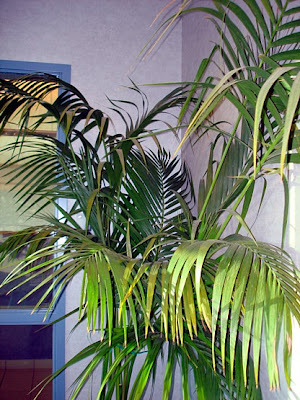 This one is a little unusual; they're usually a bit taller than this (around seven feet) before they start growing arms. 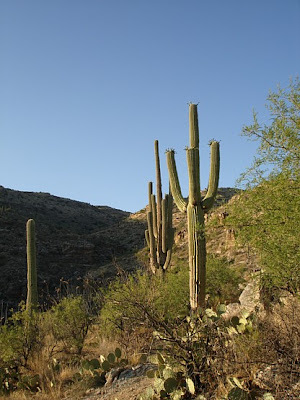 Saguaros can live 175 years or longer, and grow to be 50 feet tall. The saguaro flowers at night, and later produces these weird fruits at the top of each arm. 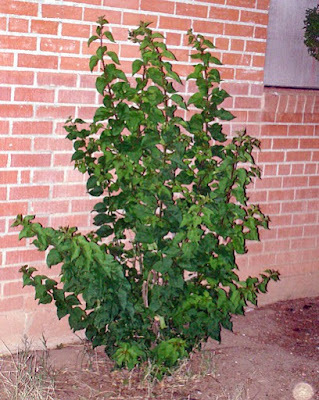 The Tohono O'odham people (and the Hohokam before them) have traditionally harvested these, using poles to knock down the fruit and then making it into jam, syrup and wine. 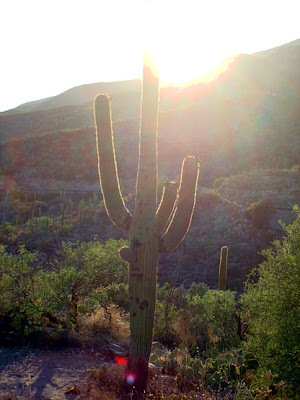 But humans are only one of the many creatures to feed on saguaro fruit and seeds. This white-winged dove was definitely having a nosh tonight. 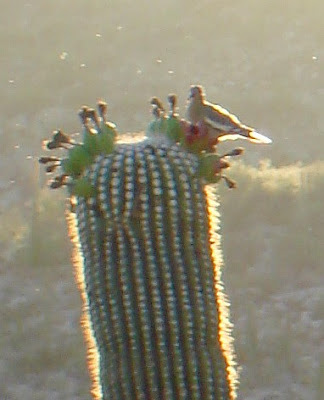 The saguaro can also be a kind of apartment complex for birds. Gila woodpeckers and flickers often drill holes in the saguaro to form nests. 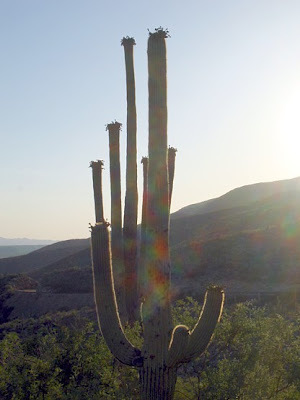 The saguaro lines the hole with kind of a woody scab, forming what's called a saguaro boot. After the woodpeckers are done with the hole, other birds move in, especially owls. Bats and bugs may also live in saguaro boots. Here are two views of what's inside a saguaro. 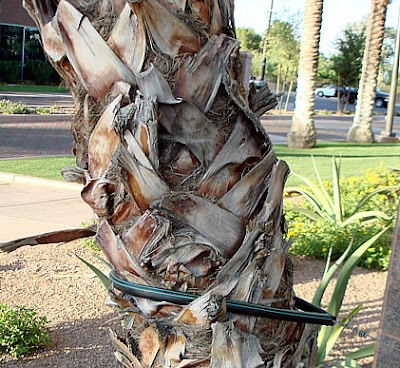 The damaged one in the foreground is showing saguaro gall, and possibly saguaro boots, both of which are ways to heal the plant and seal itself off from damage. 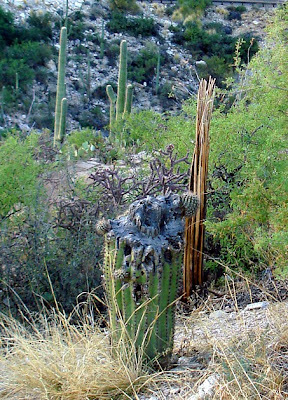 The brown sticks in the background are the remains of another saguaro. These are called saguaro ribs. They're the main structural support for the plant, and they and the boots are what's left after the cactus dies and rots away. The ribs are often used to build fences and ramadas and such. That's it! Now go see what everyone else came up with for this topic! And remember, you're more than welcome to join in the fun! Rhymes with "Door Hinge" - Sort Of!